From this tutorial you’ll learn how to utilize Brands JetElements module style for Elementor. Border Radius – here you can set the border-radius for the company logo. Border Type — here you can define the type of the border you need to use for the company logo. Alignment — here you can define the preferable logo alignment. The logo can be placed to the left, to the right, or remain centered. Title Color — here you can define the suitable color for the brand’s title. Use color picker tool to select the necessary color. Size — define the font size of the company name. Family — here you can set the font family for the company name. 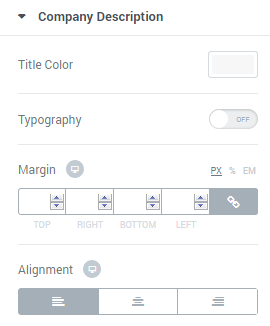 Line Height — in this field you can set the height of the company name line. Alignment — here you can define the preferable title alignment. The title can be placed to the left, to the right, or remain centered. Title Color — here you can define the suitable color for the brands description. Use color picker tool to select the necessary color. 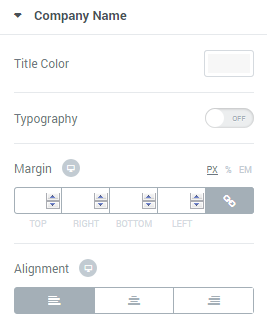 Typography — turn the option on to view the typography settings. The options are similar to Company Name Typography. Alignment — here you can define the preferable description alignment. The text can be placed to the left, to the right, or remain centered.